At the National Gandhi Museum in New Delhi, a reconstruction of Mahatma Gandhi’s house at Sabarmati Ashram, Gujarat, shows visitors to the free museum how the Father of the Indian Nation chose to live. The room is empty but for a mattress, a writing table, and a spinning wheel. The emptiness of the room emphasizes the asceticism of Gandhi’s life. Although he had come from a middle class family and had a legal education from England, he chose to live like a peasant so the rural masses could associate with him. 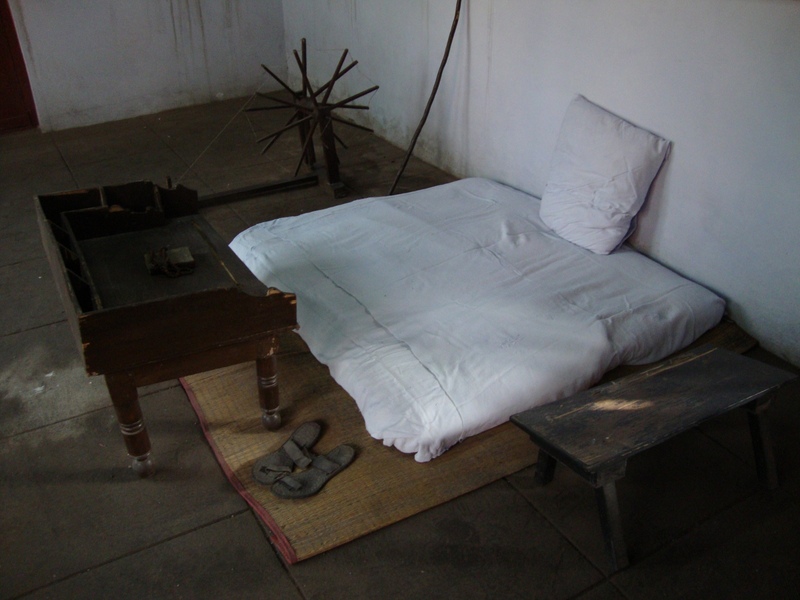 The reconstruction of Gandhi’s room at the National Gandhi Museum, New Delhi. Five miles away from the Gandhi museum is Teen Murti Bhawan, the house where Jawaharlal Nehru lived when he served as the first Prime Minister of independent India. It is also a museum, having been preserved in the condition that it was when Nehru lived there fifty years go. Although the house is not opulent by Indian or European standards (it was originally built in the colonial era as the commander-in-chief of the colonial military’s official residence), the contrast with Gandhi’s house is striking. Nehru was not an ascetic. His family started out better-off than Gandhi’s, and he did not give up as many of the trappings of the privileged life as Gandhi did. While Gandhi lived in poverty, Nehru lived in comfort, surrounded by his fine furniture and extensive collection of books. Just as the ways they lived their lives were different, so were their approaches to industry and economics. Gandhi’s hope for independent India was that the country would develop its villages and emphasize small-scale, local economies. Nehru, on the other hand, believed in large-scale, modern industry, mechanization, big dams, steel mills, and the like. Gandhi wanted hand-spinning; Nehru wanted cotton mills. The two men’s visions for independent India were nearly compete opposites of each other. Underlying their radically different visions, though, were markedly similar ideals. Gandhi disbelieved in modern industrial capitalism not because he thought that machines were inherently evil, but because he believed that machines’ potential to concentrate wealth and power in the owners’ hands outweighed any potential benefits that machinery might offer. Industrial capitalism enriched the bourgeois minority but left the proletariat poor. Gandhi felt that the inequality produced by modern industry was immoral and socially unacceptable. Nehru was also alarmed by the inequalities inherent in modern industrial capitalism. Rather than rejecting modern machinery, as Gandhi did, Nehru took a different approach. He believed that industry could be tamed and turned to the benefit of all if it existed in the context of a socialistic command economy. Rather than permitting free-market capitalism, Nehru believed in nationalizing the most important industries and instituting economic planning to define the course of the entire economy. According to Nehru, state industries, economic planning, and the command economy would allow India to enjoy the material benefits of industrialization without suffering its social consequences. As chairman of the National Planning Commission, Nehru inaugurated India’s first three Five-Year Plans before his death in 1964. The legacy of Nehru’s industrial-economic philosophy was mixed. Although the command economy prevented some of the worst abuses of power that other countries experienced under industrial capitalism, India’s predominantly rural population remained poor and subject to the interests of the urban elites. India’s command economy grew slowly during the four decades it existed. In 1991, the Indian government liberalized the economy. Since then, the Indian economy has grown more quickly, but this growth has been followed by an intensification of the inequality that both Gandhi and Nehru had feared. Although the Indian command economy no longer exists, state industry is still common in India in the twenty-first century. Across India, factories, stores, power stations, agricultural research centers, and other institutions bearing the motto “A Government of India Enterprise” are glimmers of Nehru’s socialistic economic philosophy that persist in contemporary, free-market India. The Nagarjuna Sagar Dam in Andhra Pradesh provides an example of the creative use of Indian resources for industrialization. Begun in 1955 and completed in 1967, the dam was a combined hydroelectric and irrigation project meant to irrigate the arid Deccan with the waters of the Krishna River. To save foreign exchange capital, the dam was built largely by hand with a minimum of machinery. The May 1963 issue of National Geographic carried a fold-out spread of a panoramic photo of the dam’s construction. In the image, hundreds of workers carry stones and mortar up ramps zigzagging up the face of the dam. The photo caption declared that 125,000 workers were employed in the construction of the dam; a more recent article in The Hindu Magazine stated that at no time in the construction of the project was the workforce ever small than 50,000.6 Compare this to the Grand Coulee Dam, another combined irrigation and hydro-electric make-work project of a different era; the labor force never exceeded 11,000. The Nagarjuna Sagar project came vividly to mind once during my sojourn in the Garo Hills. I observed (and briefly participated in) a labor-intensive house construction project. While nowhere near the scale of Nagarjuna Sagar, the project nevertheless represented the principles of using the readily-available resource of labor and sparing on machinery. 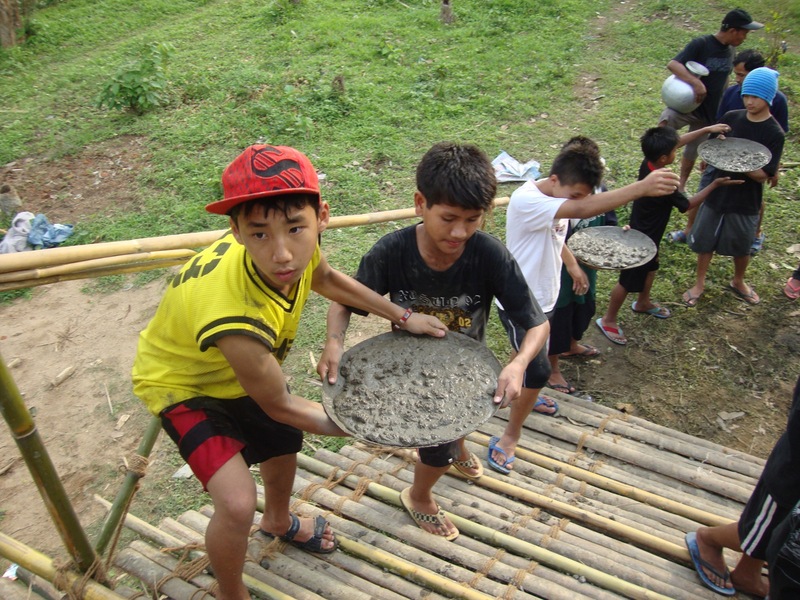 Principal was building a house down the road from my school, and Headmaster dispatched several dozen boys one day to supplement the hired labor force in the task of pouring the concrete for the roof. I wandered over later in the afternoon to observe. A bamboo ramp (like at Nagarjuna Sagar, but much smaller) led up to the roof. Boys passed saucers-full of concrete from the cement mixer (the only machine on the site), man-to-man up to the roof. There, professional laborers dumped the concrete at the appropriate location and smoothed it out, while boys on the other side of the ramp passed the empty saucers back down to the cement mixer. Then the saucers began their circuit once again, and continued circling man-to-man until the entire roof was covered with freshly-laid concrete.